Home > All Other Industries > Other Industries J - M > Lone Star Industries, Inc. 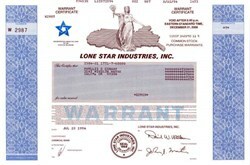 Beautifully engraved warrant certificate from Lone Star Industries issued in 1994. 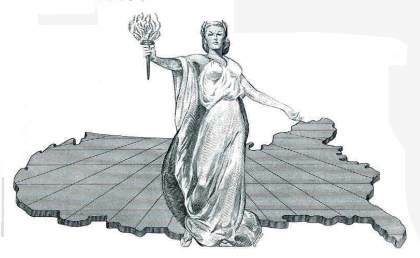 This historic document was printed by the American Banknote Company and has a vignette of an allegorical woman holding a flame and standing on a map of the United States, and the comany's logo. This item has the printed signatures of the Company's Chairman of the Board (David W. Walker) and Secretary ( John Martin ). Lone Star Industries, Inc. was incorporated in 1919 as International Cement Corporation in Maine. In 1936, the company changed its name to Lone Star Cement Corporation. Its state of incorporation was changed to Delaware in 1969, and in 1971 than name was again changed to Lone Star Industries Inc. Now the largest domestically owned company of its kind in the nation, Lone Star had net sales of approximately $357.6 million in 1997. Lone Star Industries is a subsidiary of Germany-based Dyckerhoff. Lone Star's cement operations consist of five Portland cement plants in the Midwest and Southwest, a slag cement grinding facility in New Orleans, LA and 25 percent interest in Kosmos Cement Company, which owns and operates one Portland cement plant in Kentucky and one in Pennsylvania. The company's ready-mix concrete business operates several facilities in the Memphis area. All of Lone Star's five Portland cement plants are fully integrated from limestone mining through cement production. The cement plants are in Cape Girardeau, MO; Pryor, OK; Oglesby, IL; Greencastle, IN; Maryneal, TX. The company estimates that it has limestone reserves sufficient to support operation of these plants at current levels of production for 30 to 100 more years. The company's five wholly owned cement plants produced approximately 3.9 million tons of cement in 1997, approaching the rated capacity of the plants. The New Orleans facility produced 190,000 tons of slag cement during 1997. Lone Star operates 15 cement distribution terminals in 10 states. Cement terminals receive bulk cement from their respective source plant by barge, rail or truck, depending on distance and location. Cement is stored in silos at the terminal until it is loaded out to fill a customer order or packaged for distribution through the same customer channels. Four of the plants and seven distribution terminals have packaging facilities. Lone Star has almost 700 employees, and their dedication continues to be one of Lone Star's most valuable assets.